The car is a 1990 s13 with a redtop SR.
First things first, swap over the throttle body from your old KA onto the SR. Next, there are two different ways you could go. What seems like the easiest is to use the KA throttle cable bracket as well since it can accommodate both the throttle and cruise control cables. You will need to first drill out the holes in the bracket a little. You must also grind off the back of the bracket. This is so you can position the bracket in such a way that the cables aren’t pulling crooked when opening the throttle. Here is the KA bracket after I modified it to work. The other method is to get a piece of sheet metal and fabricate your own bracket. It would probably be easiest to make a mock one out of cardboard, and then trace it onto the metal. Cut it out and bend it in a vise. 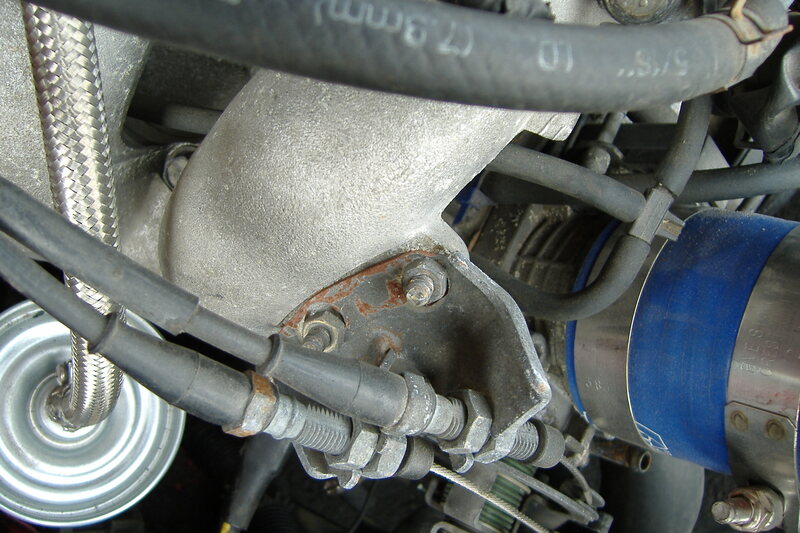 Hook up the throttle cable and cruise cables to the throttle body. It may now be necessary to adjust them. Loosen both nuts on the cables until there is slack, then tighten them down until they are just tight, but not holding the throttle plate open at all. Tighten the nuts back down. Everything that needs to be done under the hood is now complete. Now get ready to curl up into a ball under the dashboard! 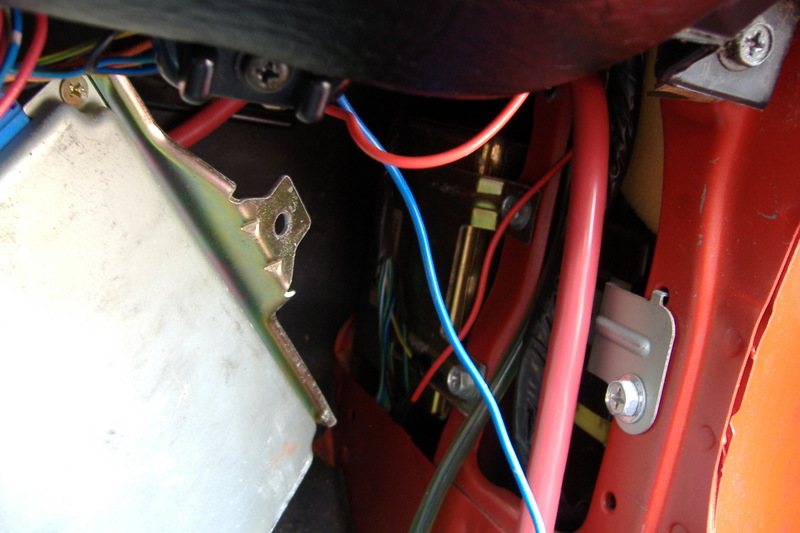 You will need to remove the passenger side kick panel to expose the ECU. Once you see the ECU, take out the 2x 10mm bolts holding it in place. Once that is out of the way, you will see a small brass-colored module that looks like a smaller version of your ECU. This is the cruise control module. It is also held in place by 2x 10mm bolts, but they are both on the same side, rather than on top and bottom like the ECU. Unbolt it. This is where the electrical wire come into play. You need to jump the speed signal from the ECU to the Cruise Control Module. If you look at the connector on the cruise module, you will see a wire that is yellow with a green stripe. It is for the speed signal. Cut this wire about 2 inches up from the connector. Now solder your piece of wire to the end of the yellow w/ green stripe wire that is still connected to the cruise module. Bolt the Cruise module back into place. Now back to the ECU. There will be that same yellow with green stripe wire coming from your ECU connector. When you completed your SR swap you actually had to cut it and match it up to another wire on the connector that runs up into the dash. That is where the speed signal, tach signal, and other things go up to your gauge cluster. I just connected my “speed signal jumper wire” into that same spot, using a 3 way connector (this is so the speed signal still reaches your speedometer). So now you have jumped the speed signal from the ECU to the cruise control module. Bolt your ECU back into place to make sure it is grounded, and put your kick panel back into place. Enjoy cruise control.